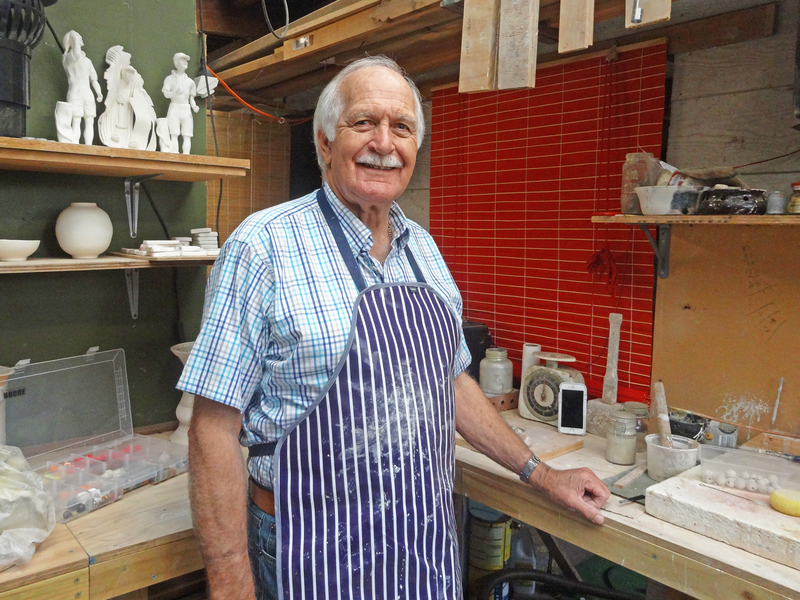 Silkyecho Pottery was founded by Rodney and Heather Halliwell in 1980. A vision to take a handful of wet earth and transform it into something beautiful metamorphosed into the creation of functional pottery, unique figurines, and pottery art pieces. 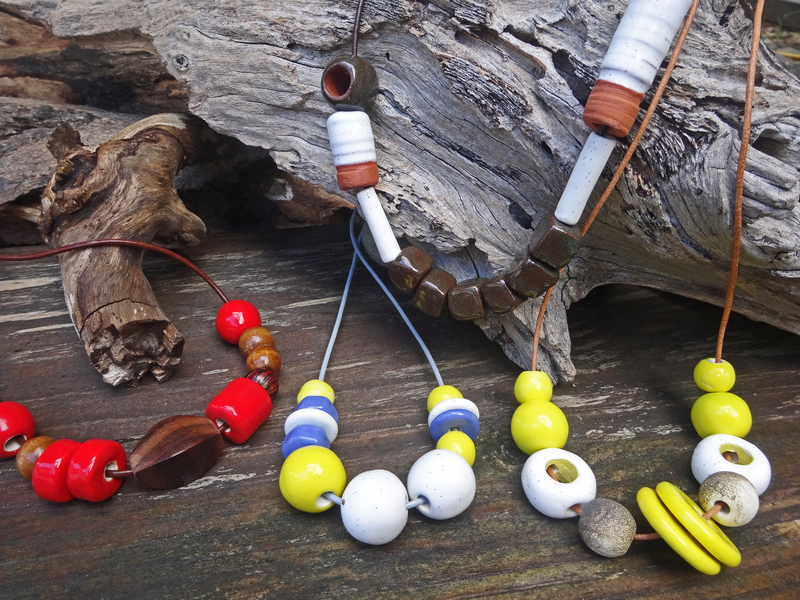 More recently we have embarked on a new chapter in the life of Silkyecho with the introduction of handmade pottery jewellery. 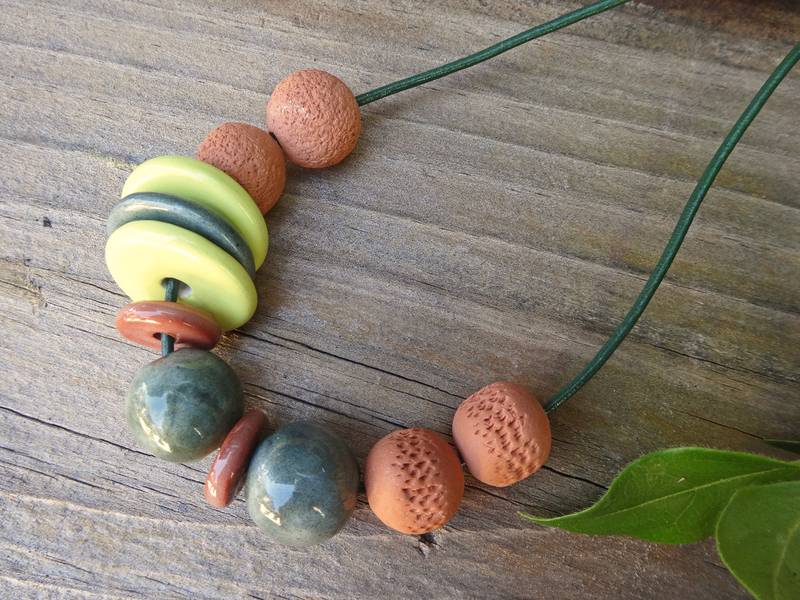 Our range is diverse, combining rustic, earthy, and primitive clay beads with highly glazed clay beads, and blending these with glass, wood, metal, paper, and acrylic elements to create thoughtful and expressive pieces. I grew up on a 60,000 acre sheep station, 50k north west of Tilpa in an area commonly known as ‘The Outback’, 165k south west of Bourke. It’s a vast landscape where the red and black dirt and clay pan flats support very little vegetation, and the dust storms descend with a wild fury, wreaking havoc and leaving layers of thick red dust on everything in their path—a land where the crows fly backwards to keep the dust out of their eyes. Despite its harshness, I loved the red and black country then and still do today though I have lived in Sydney since I was 17. I was always drawn to working and creating with my hands. As a young boy I would watch my grandfather craft unique objects from anything he could get his hands on (including wood, shells, and matchsticks) and offer my help. At school, I looked forward to my woodworking classes and woodwork became a hobby, with many leisure hours spent chiselling, turning, and smoothing. As an adult, with the pressures of full-time work and raising a family, the need for a therapeutic pass-time resurfaced and working with clay seemed a natural progression. The vision of taking a handful of wet earth and turning it into something beautiful and unique was the challenge that I needed. I studied under Lance Leedon to master the art of hand-building, throwing, and glazing, and perfecting my craft. The hobby turned into a consuming passion for creating and I took the next step. 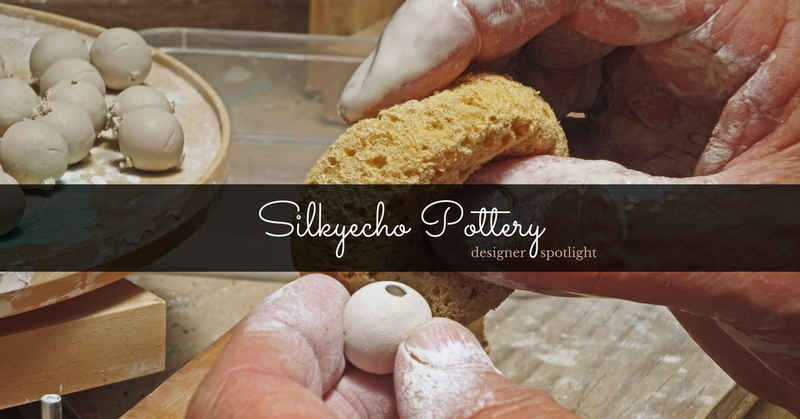 In 1980, my wife Heather and I founded Silkyecho Pottery. My studio was at the rear of a shop that I leased to showcase and sell my pottery, as well as pottery and crafts sourced from specialist crafters and commercial potters. It was a small business venture that proved to be both pleasurable and rewarding over several years. At the same time, we owned, showed, and bred our beautiful Afghan hounds, an ancient breed with power, aloofness, and a rare beauty. To celebrate the breed, we began to create sculptures and other artwork depicting these qualities for the enjoyment of owners and lovers of Afghan hounds. It wasn’t long before this creative arm spread to other dog breeds as well, and our artworks have homes in several countries including England, France, Canada, USA, Portugal, Sweden, New Zealand, and of course, Australia. This was an amazing time in our lives - creating art pieces together that provided such joy and ongoing pleasure for so many people - however, it was totally absorbing and as we were both working full-time we had to pare our activity back to save our sanity. Silkyecho took a well-earned break for several years until we retired from full-time work. We both hungered again for a creative outlet so in 2015 we embarked on a new chapter in the life of Silkyecho with the introduction of handmade pottery jewellery. 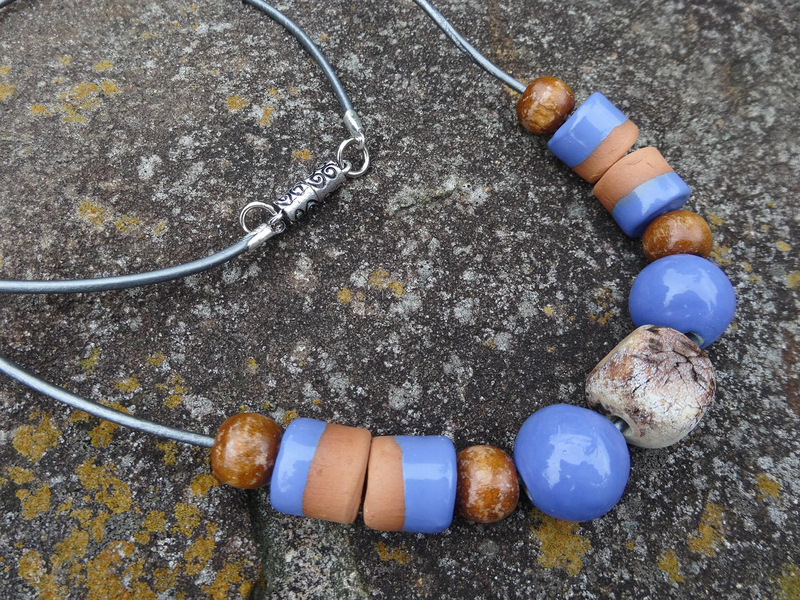 My current focus is to offer a selection of pottery jewellery with a point of difference. 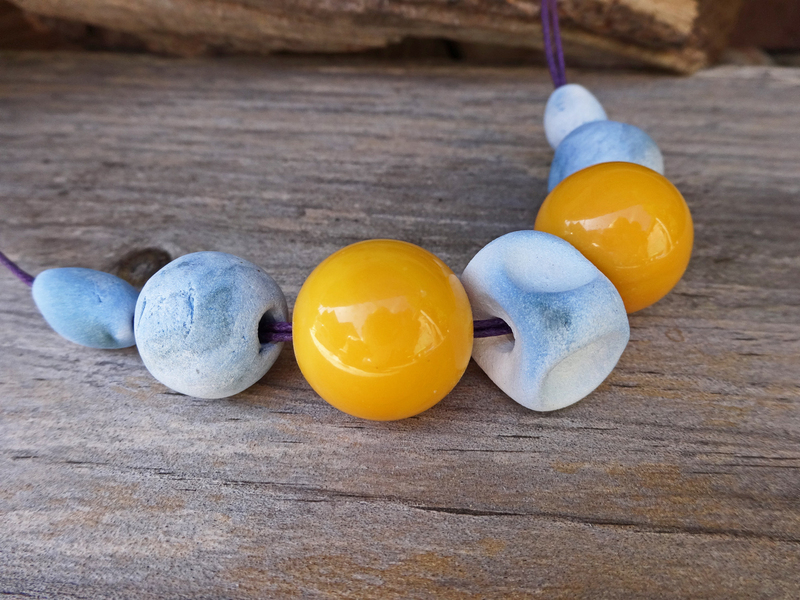 There is a huge assortment of beads available on the market but, as an artisan, I wanted to create something different in the form of handmade pottery beads, bursting with originality and an element of surprise. I developed a small range over several months and brought together a collection that was released for summer 2015. Since then, my range has increased considerably and will continue to evolve, guided by new ideas and experimentations. Whilst I craft all of the pottery elements, both Heather and I have a hand in the design of the pieces and we share the glazing and compilation of the jewellery. I grew up in Sydney having no familiarity with the Outback, however I feel the same love for the land as Rodney. We travelled to the United Kingdom, Europe, and several countries in the Asia Pacific Region throughout our professional careers as well as each Australian State and Territory, and in retirement we have been drawn to discovering much more about Australia’s natural environment. We love the coastal areas but for us, there is something even more special about the spiritual heart of the country. I am an avid amateur photographer so every trip is an opportunity to explore the landscape through my camera lens and capture not only what I see but also what I sense and feel. As soon as we return home from a trip, I can’t wait to write my travel journal and furnish it with hundreds of photos to record our experience in detail. I use Photoshop to perfect my photos and Publisher to produce my books that frequently exceed 500 pages. My coffee table travel books are then professionally printed and bound and take pride of place in our home. I have never been interested in working with clay but I enjoy watching Rodney go through the various processes and love to jump in to do my share in finishing the pieces whether this is by designing, painting, glazing, or assembling. In the infant stages of Silkyecho, my passion was to paint in underglazes and oxides on Rodney's bisque fired pottery pieces. My favourite artwork was a head study of an English Springer Spaniel which resides with her owner in England, and I still feel the same excitement when I look at the photo of the piece as I did when I finished it. 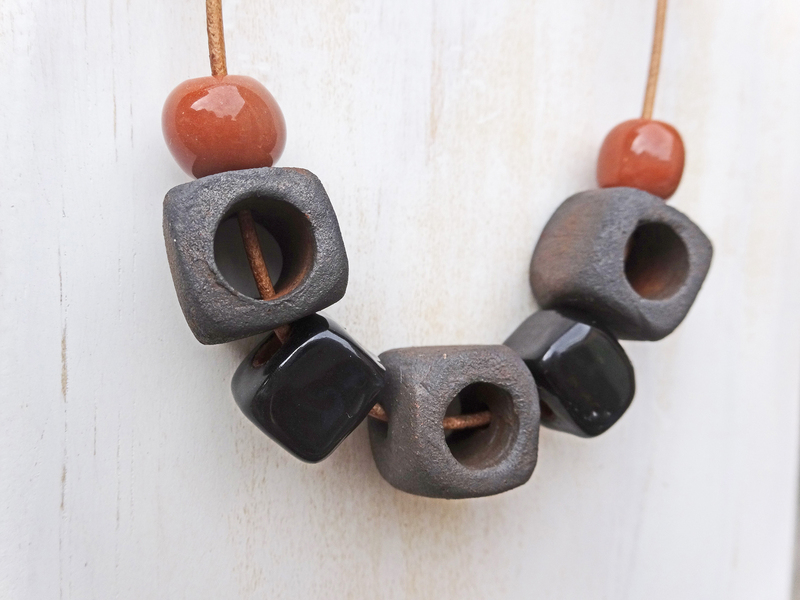 More recently, when Rodney suggested he would like to make pottery beads I knew that this would be another way we could work together with a common focus to produce something different and exciting. 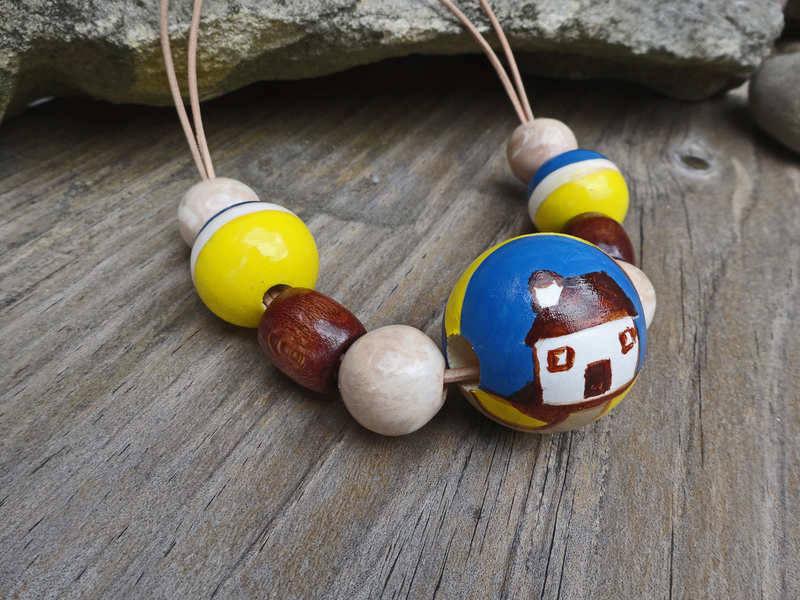 We have also broadened the range of our work to include hand-painted wooden beads where I have the creative licence to follow my fancy. I absolutely love this side of my work because of its flexibility as it is something I can do for five minutes or hours depending on my mood and come back to it whenever I like. Inspiration for our jewellery comes from the natural environment and its multitude of colours that evoke our senses. 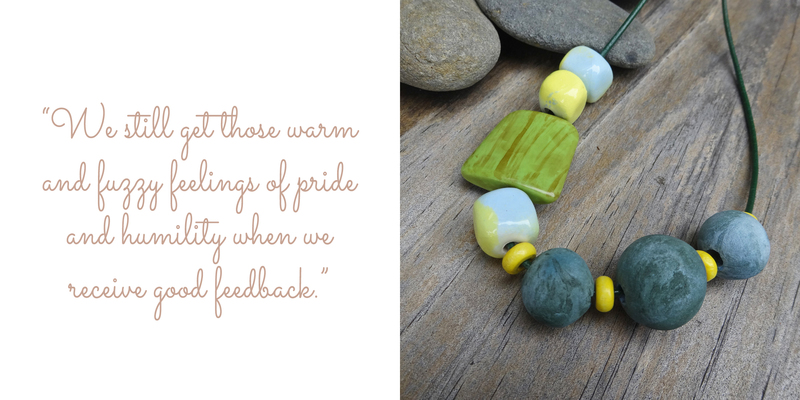 We work with bold colours and neutral shades and combine pottery beads with other elements such as natural stone, glass, acrylic, and wood in many of our pieces to both accentuate and to soften the lines. 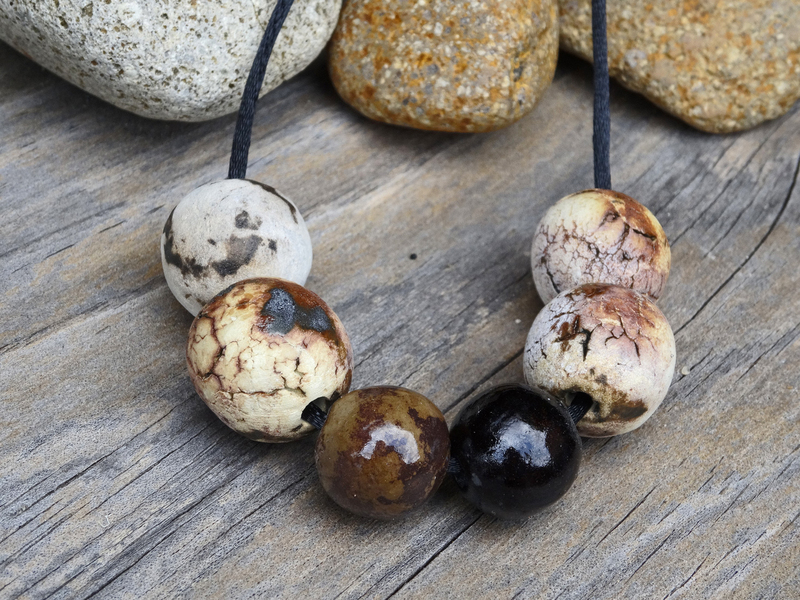 Our pottery beads are made from Australian clay that is fired in a pottery kiln to temperatures above 1,100 degrees and occasionally, bisque fired beads may also be taken through a wood or pit firing. A number of techniques are employed to produce different finishes, some of which may be reasonably predicted, while others are a surprise, even to us, and may never be repeated. 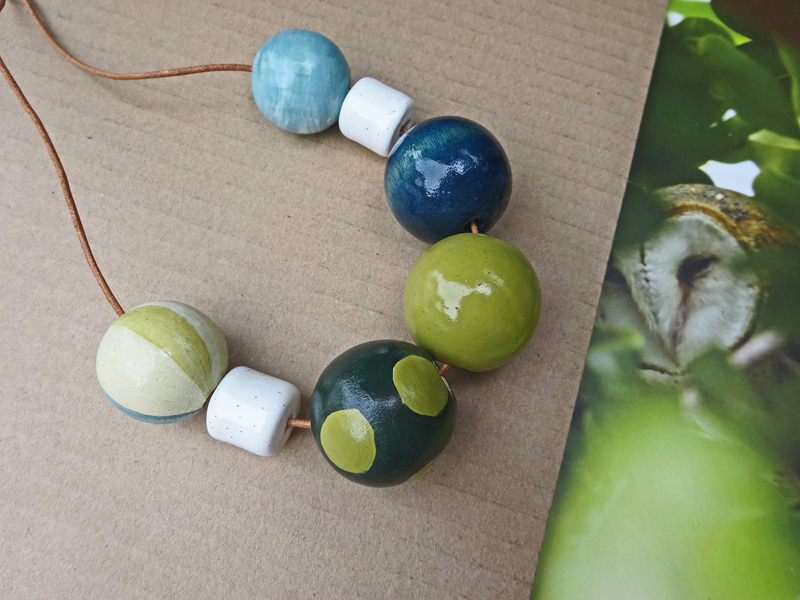 Whether the beads have a smooth gloss glaze or retain their earthy colour and texture, they all hold that special attraction of a handmade, individual bead that you will not find anywhere else. Rodney’s pottery studio is an indoor/outdoor workshop inside a huge triple garage space set near the rear of our property and has an ambience that lends itself to creativity. Musical interludes from lorikeets, parrots, noisy miners and magpies, the wind moving the trees and shrubs, and the sound of running water from our water features, are often the only interruptions to the quietness. Rodney loves having a special space away from the heart of our home to work, dream, and create. Having said that, pottery manufacture is a messy process that needs to be contained in an “away from the house” space, as do his kilns, so really, he has no choice in the matter. In addition to the pottery studio, one of our spare rooms inside the house has been turned into a workroom for the assembly and finishing-off of the jewellery pieces and is also where I do all of my painting on both the pottery and wooden beads. For us, the things that make handmade so special are encapsulated in the uniqueness of the items. Each piece is an expression of the imagination of its maker, brought to life through time and effort, and the desire to create something for personal satisfaction of achievement and for the enjoyment of others. Those who buy handmade gifts are special people too, because they have taken the time to find that unique piece to express their feelings. We believe that the art of giving is not in the expense but the ability to find that special something that will tug at the heartstrings of its recipient. 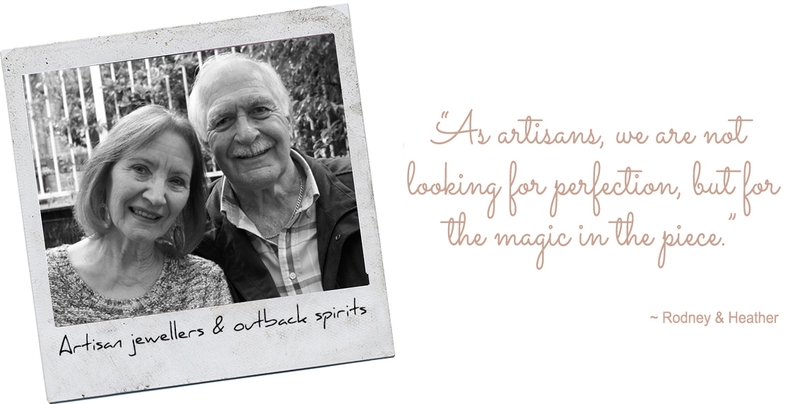 We give out of love and handmade is made with love - what could be more special? 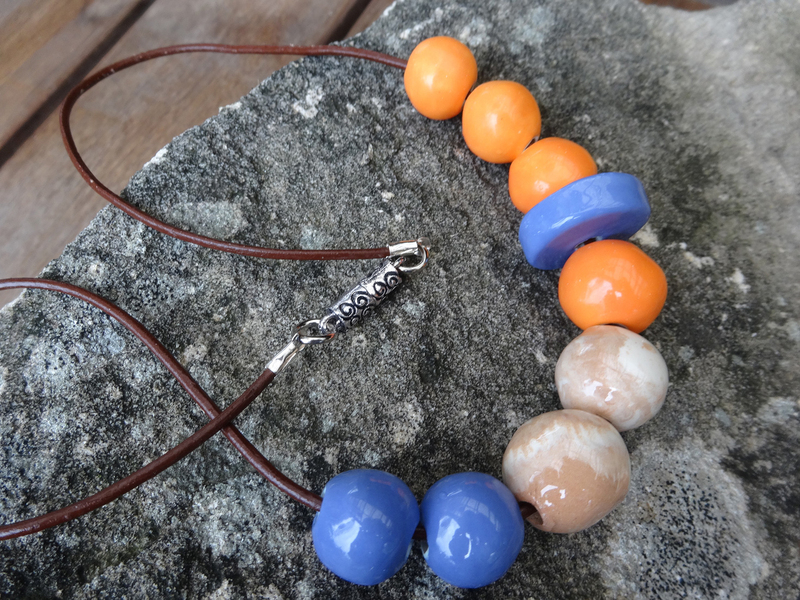 Our handmade pottery beads do not presume to be identical or perfect. Each one is unique, so sizes, shapes, textures and colours will vary. We embrace these variances as the very essence of handmade products that sets them aside from mass-produced items. As artisans, we are not looking for perfection, but for the magic in the piece; the form, the rawness, the texture, and the feelings that it evokes. Each of our pieces is named based on what it represents to us, but of course, the eye of the viewer will have its own interpretation. We just love it when others love our work. Even after so many years in this field, we still get those warm and fuzzy feelings of pride and humility when we receive good feedback. It spurs you on to want to do more. We have had a lot of fun so far and are looking forward to continuing in this field for as long as the passion and excitement is there. We joined the Made It community in June 2016. Made It is the perfect platform for us to showcase our jewellery and we have been delighted with the response we have received. We also love to look at what like-minded, passionate people create and are always amazed at the breadth of the scope and the depth of quality. 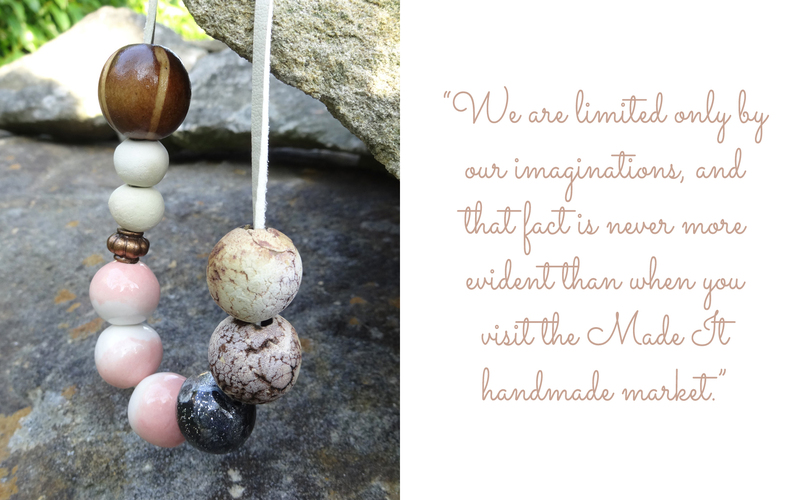 We are limited only by our imaginations, and that fact is never more evident than when you visit the Made It handmade market. It is such a great platform to showcase and celebrate Australian talent and for people to find that special gift for a friend or themselves. The Made It site is beautifully presented and is user-friendly for store owners to update entries and for buyers wanting to browse products. The support given to us by the team has been exceptional. We have been afforded exposure through Newsletter Items and the inclusion of our pieces in the Editor’s Pick section and are most grateful for the opportunity to feature in the Designer Spotlight to share our story. We love spruiking “the benefits of checking on Made It before shopping elsewhere” to our friends and many have accepted the challenge and bought items that they have been delighted with.